NetEnt sure like to make a grand entrance into the year, and while they tend to keep their regular releases coming just as scheduled, they also like to make an impression with something that stands out. According to a short 30-second teaser that they have provided, along with a date that marked the official statement regarding their future plans, this year, NetEnt are planning to take on the all-time holiday 90s classic blockbuster Jumanji. After the teaser stirred up enough public interest deservedly so with its astonishing CGI animation of a very recognizable lion, NetEnt have made a public statement. The beginning of 2018 saw them partnering up with Sony Entertainment Studios in order to follow procedure in acquiring the rights of the famous movie, as well as to try and get as many characters as possible. The formal statement did not reveal the exact date of release, leaving players wondering if they’ll wake up in the middle of 2018’s summer days or even winter time and find it on their favorite casino websites. Many have managed to draw a rather apparent parallel between this NetEnt endeavor and all their previous ones from past years. Namely, the company is constantly working up ways to revive movie classics, but without settling for any title and going strictly to the blockbusters of an age. Thus, the much awaited Jumanji slot is the latest software product in a line where it’s preceded by Aliens, Planet of the Apes or the entire rock band tribute. With Motorhead, Guns’n Roses and remaining slot titles reaching massive popularity among global player pools, Jumanji won’t take too long to lure you into the adventures of the jungle. Considering the fact that the crowd is double the regular volume and both movie buffs and online slot lovers are impatiently waiting for the final look, any and every little detail about the end product counts. In terms of the graphic design and storyline, the Swedish game developing company has established quite a name for itself, marking the industry with its beyond-this-world designs, sound effects and animations. And with the storyline of the movie everyone used to know and love, there is no other way it can go but straight up to success. 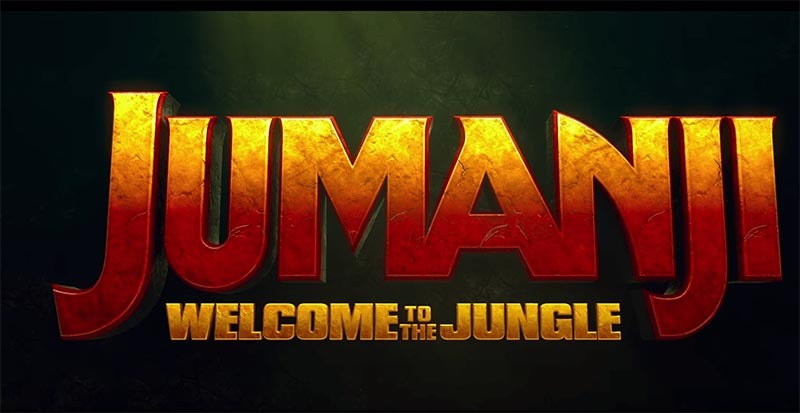 Jumanji: Welcome to the Jungle, as an officially awaited slot game, provokes players’ interest in other game features – symbols, bonuses and reward rounds. Since the latest public statement referred to the company’s partnership and thus, the rights to the movie, not much has been said about the slot features. Nonetheless, numerous online sources claim that the characters are most likely to take on certain symbols on the reels. Furthermore, predictions are that bet size will range anywhere between $0.10 and $100, with a maximum win amount that is well beyond a 1000x the stake. The one thing that can be claimed for sure is, as expected, the game’s accessibility. This means that, just due to the fact that it is a NetEnt product, this slot is expected to be available as both an instant-play browser version and a downloadable app for desktop as well as mobile OSs, including major systems like iOS, Android and Windows. Until then, players are more than able to check out their existing game selection and make the most of their excellent player bonuses and promotions. Players are definitely bound to benefit from another invention by NetEnt, even more so considering it draws upon the glorious piece of cinematic work, Jimanji, back in 1995. All it remains is to wait for the official public release in 2018’s Q2 or Q3, and see for yourself how worthwhile it had been.